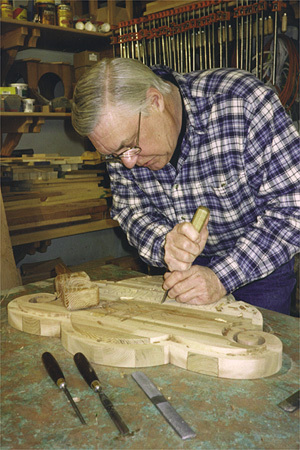 Ken Kaiyala's interest in making things, and woodworking in particular, showed itself in 7th grade shop in Portland, Oregon where his work won a city wide craftsmanship award. Ken went on to a technical high school, Portland State College and Oregon State University where he studied science and manufacturing engineering. For 20 years Ken worked as a manufacturing engineer, engineering manager and facilities manager in the foundry industry. All the while continuing woodworking and art as hobbies. He also designed and built his own family's home during this time. In 1981 Ken started The Design Factory as a part time business designing and making custom woodwork items. In 1984 this business became his full time passion. In 1987 Ken opened a second business to manufacture architectural millwork, high volume wood products and complete large woodworking projects. Clients included Keystone Lighting, Columbia Lighting, Carver Stereo, local cabinet shops, local residential and commercial building contractors. In 1995 Ken left managing this big business and returned to his real love...designing and making specialty woodwork projects. The most rapid growth in this rejuvenated business has been the design and manufacture of hand carved signs and their mounting structures. The Design Factory now has 3 full time skilled craftsmen with several more waiting in the wings. Ken's role in The Design Factory now is moving rapidly toward design, client interface, training and completion of specialty carvings. He sees no limit to what The Design Factory can create or where it can be installed.